Base opponents now have concrete and irrefutable evidence to back up what they have suspected and declared for a long time. Assembly Woman Chang Ha-na has found and disclosed the full record of the meetings between the Prime Minister’s office and the Technical Committee, revealing publicly the complete lie of the so-called “civilian military dual use port”, as well as the general deception, and poor and hurried planning behind the Jeju Naval Base Project. 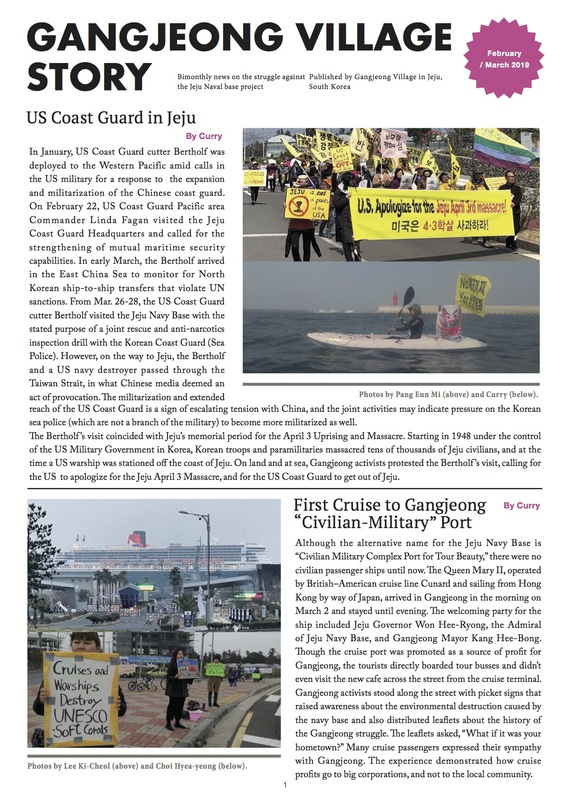 The following article appeared on the Hankyoreh website on Oct. 10 and was the headline article on the front page of the Korean print edition on Oct. 11. Click to see original article. 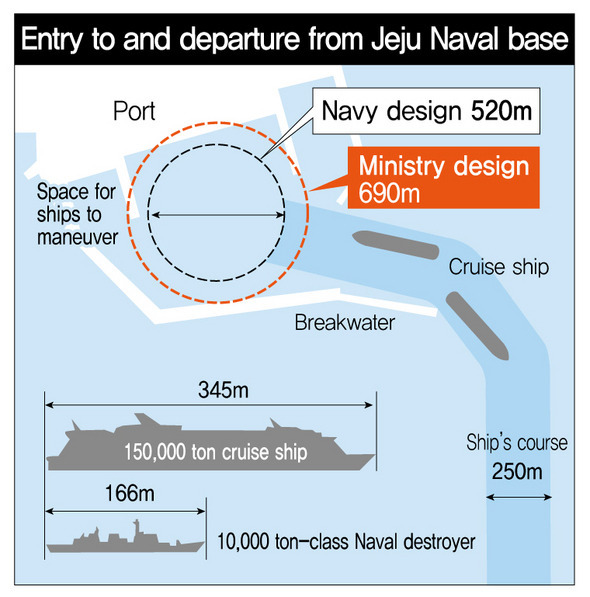 Evidence suggests that the government ordered data to be doctored to allow for the construction of a controversial naval base on Jeju Island without conducting simulation safety tests for cruise ships entering and exiting the base. Accounts from members of the technical committee examining the base, ostensibly a joint civilian-military “tourism harbor,” suggest it was designed as a military port, with the simulations planned only to give the appearance that it would also be accessible to 150,000-ton cruise ships. Democratic United Party Rep. Chang Ha-na, who sits on the National Assembly’s Environment and Labor Committee, disclosed full records on Oct. 10 from four meetings of a technical committee under the Office of the Prime Minister that convened in January and February to examine the port’s suitability cruise ship entry and departure. The six-member committee had six members recommended by the ruling New Frontier Party, the opposition, the administration, and the province of Jeju. At the fourth meeting on Feb. 14, one committee member hinted at government doctoring of the data for a simulation on the port’s safety for 150,000-ton cruise ships. “The government’s telling us to come up with data that would allow construction to begin right away without a simulation,” read the records of the technical committee’s meetings. Also, at the first meeting on Jan. 26, members of the committee made statements to suggest that the port was originally designed as a naval base, with no design changes to make it suitable for use as a civilian harbor. Statements made at the second meeting on Jan. 30 indicate that the design changes in question were not made, showing the government’s pledge to have been false. The committee was chaired by Sogang University professor Jeon Joon-soo and included Korea Maritime University professors Park Jin-soo, Kim Se-won, and Kim Gil-soo, Cheju (Jeju) National University professor Lee Byung-gul, and DY Engineering executive director Yu Byeong-hwa. The secretary was Im Seok-gyu, Jeju policy officer for the Office of the Prime Minister. After four meetings, the committee concluded with the recommendation that a vessel simulation was needed to take into account the repositioning of harbor structures and placement of tugboats without major changes to the existing harbor design, and was then disbanded. Since the committee’s fruitless discussions and non-binding conclusion, the government and Navy have pushed ahead with the construction, conducting no simulations and making no design changes to date. The project is currently 22% complete, according to the Navy. Other evidence surfaced to suggest the committee members were told that the construction would continue and there would be no design changes. Another member responded, “Right now, the government’s worried that the construction is going to be delayed” by a simulation. Chang declared that the meeting records bore out suspicions that the government and military planned the harbor as a military port and looked for a way around the 150,000-ton cruise ship issue after the President made his remarks. “They need to halt the naval base construction and reexamine [the port] from square one,” she added. 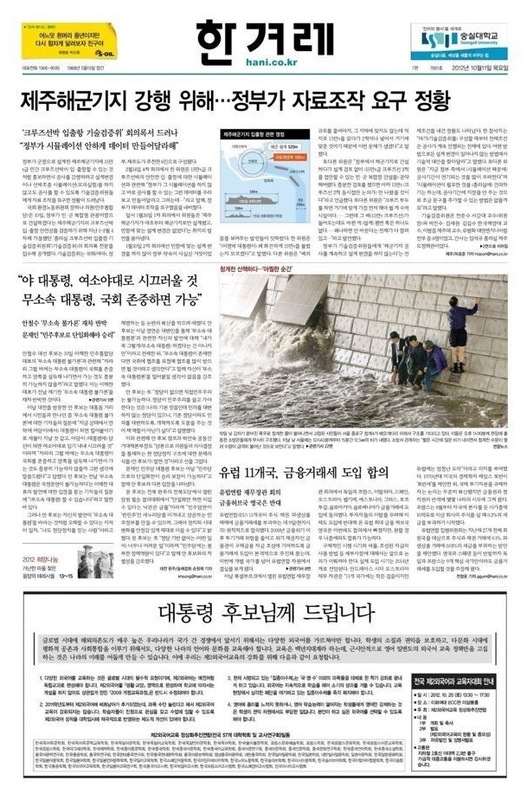 Front Page of the Korean Print Edition of Hankyoreh.